A basic baked salmon recipe contains nothing more than salmon, lemon and vegetable oil. If you wish, you can also add a sprinkling of pepper or other spices. You can dress up this basic recipe to your taste. Add a teriyaki marinade and some grilled pineapple for an island twist. Or add a marinade made from equal parts brown sugar, butter, olive oil, honey and soy sauce for a sweet honey glaze. Once the salmon is out of the oven, top it with a fruity salsa for a south-of-the border meal. Preheat the oven to 400 degrees Fahrenheit. Coat the bottom of a baking pan with 1/2 tsp. vegetable oil. Cut the salmon into serving-sized pieces. Place the salmon pieces skin-side-down in the baking dish. Squeeze the lemon juice over the salmon. Brush each portion with a light coating of olive oil. Add cracked black pepper or lemon pepper to taste. Place the baking dish in the center of the oven. Bake the salmon at 400 F for 15 to 20 minutes. You can marinate the salmon for about an hour before baking it. Put the salmon in a bowl with a lid and pour your favorite marinade over it. Let the bowl sit in the refrigerator while marinating. You can also pour a light coating of the marinade over the salmon before baking instead of using the lemon and olive oil. 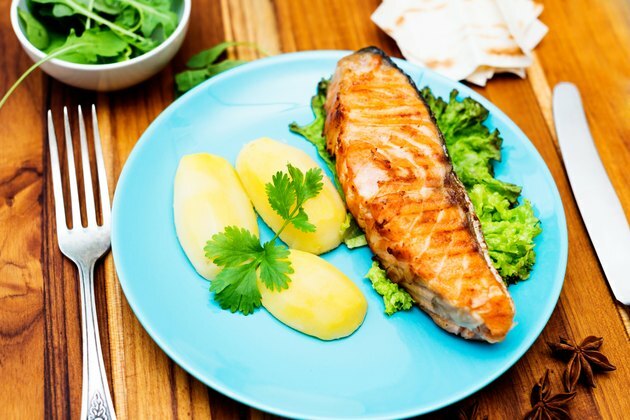 Salmon is done when it can be flaked with a fork. To be safe, however, use an instant-read thermometer inserted into the thickest part of a fillet to see if the fish is done. The thermometer should read at least 145 F.
Keep the salmon chilled until just before you are about to put it into the oven. Doing so helps prevent food-borne illness. Thaw, store and marinate the salmon in the refrigerator. If you want to add toppings to the salmon, cook them separately and add them after the fish is done. Piling toppings on the salmon before putting it into the oven creates an insulation layer for the fish and increases the chances of parts of the fish being undercooked.